We are two weeks out from closing on our new place and moving. Luckily our current place is under contract, allowing us to start the packing process. Two entirely full truckloads went to donation. It was time to let go of the heavy bag I’ve been carting around for the past ten years; there hasn’t been a spot to hang it in our last two homes, and there isn’t a spot in the new place either. It was also finally time to let go of the thousands of cards and letter from friends and family through the years, but not without an entire afternoon of skimming through each one. That day was bittersweet; such warm memories relived but sad to realize these special communications are nearly extinct due to social media and smart phones. Stacks of boxes are beginning to demand attention as we’ve hired the movers from Merganthaler and all the final details like setting up new insurance and filling out an official change of address with the US Post Office (it is worth the $1 charge to do this online!) and getting new internet ready (our address is new and nobody wants to service this new location) are in effect. Nothing is ever as easy as it seems. Through all of this, all I can think of is how long can I keep my kitchen intact?? For most, it is the last to get packed and the first to get unpacked. But even with that plan in place, there is quite a bit of kitchen pre-packing needed because I have an unusual amount of kitchen trinkets. I’m not a pack rat or a hoarder, but I do love collecting little kitchen dishes, interesting utensils and old-world cooking vessels. Partially for photography sake but mostly because I’m just drawn to kitchen character. Packing is underway, cooking classes are on hold and I’ve resolved to live in a minimalist kitchen for the next few weeks. This got me thinking about what really are the bare essential, key items one needs to outfit a kitchen? Do I really need to own a whisk, an old school manual hand beater (who even remembers these? ), a hand electric beater, an immersion blender, three upright blenders and a stand alone mixer? Operation “Kitchen Pare Down” is underway. Today I begin the painful process of deciding which utensils and pans make the cut, already knowing some of my favorite indulgent items won’t make it. There are a few obvious items already in the “stay” pile: a chef knife, a paring knife, measuring cups and spoons; for the remainder I’ve devised a system. I’m putting EVERYTHING from the kitchen into boxes. I’ll remove the items I need to cook with over the next four weeks, everything left in the box at the end of the month isn’t really needed. Probably. Maybe. I’ll post the final list here and you can all weigh in. In the meantime, moving also means cleaning out the freezer. I save all my kitchen scraps for broth and have amassed two large bags full so it was time to make homemade broth. 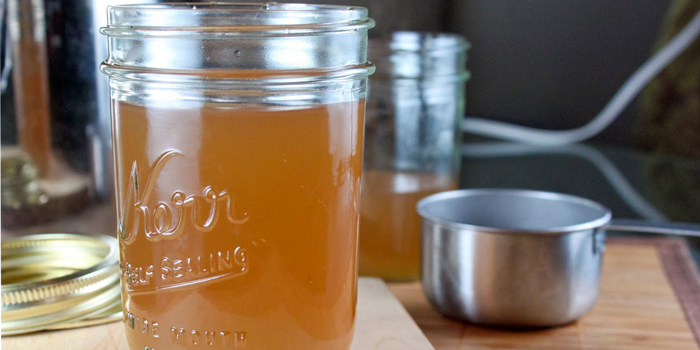 Broth is a simple, easy and delicious way to use up vegetables. Below is my basic broth recipe. This is a super flexible guideline only. Adjust with what you have available. Once you have this made, use it in soups and sauces and definitely cook all your grains in it. It’s a great way to get extra flavor and nutrition without added calories or fat in your Fat and Happy dishes. Place all ingredients in a large pot and cover with water. Bring to a boil over high heat. Reduce to a low simmer and cook about 1 hour. Strain and discard solids. Stir before using if broth separates. For more flavor, caramelize the vegetables in olive oil before adding the water. Do not stir the stock, just let it gently simmer. 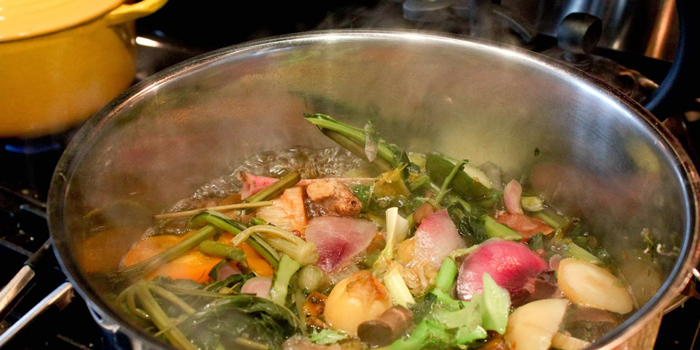 Keep the stock in the refrigerator for up to 1 week or in the freezer for up to 6 months. Fat and Happy Food Blog Tips and Techniques: Save all your vegetable trimmings in the freezer; use ends, left over veggies, veggies that are on the brink of going bad or that you might not get to using. I save everything, even fresh ginger scraps, apple cores, kale stems and even citrus rinds.